Join the Door County Land Trust for a snowshoe, ski or hike adventure at Heins Creek Nature Preserve on Feb. 9, 1-3 pm. 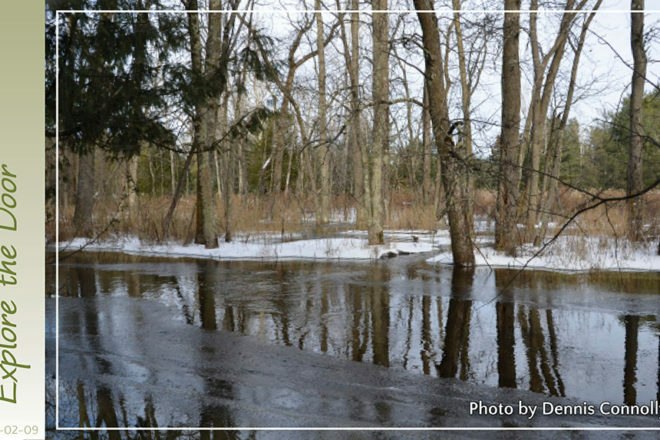 Explore this preserve’s wooded sand dunes and creek, and search for its winter inhabitants and animal tracks. The sand dunes were formed thousands of years ago after the glaciers melted and lake levels dropped, closing off the ancient bay of Lake Michigan, forming today’s Kangaroo Lake, which drains through Heins Creek to Lake Michigan. The trails are relatively flat and easy to traverse. The hike will cover a portion of the one-mile trail system and will take approximately two hours. Participants must provide their own skis or snowshoes. Duane and Leslie Youngsteadt will lead the hike with co-leaders Larry Desotell, Sarah Freyman and Tom Clay. The hike is free and open to the public. Heins Creek Nature Preserve is located at 7112 Hwy 57 in Baileys Harbor.